fraser thompson loop. we took a day off from the garden to have a picnic at marble canyon (pavilion lakes). the weather was perfect and the land still green and alive with roadside flowers. in a few weeks the same drive will be bristling with dry grasses, tinder trees and the sweet smell of sage. the fraser was in full flood, scouring the sides of the canyon with determination. the section of hwy 99 between lytton and lillooet was a joy to drive, winding through small ranches and hugging, in spots, the very edge of the canyon. 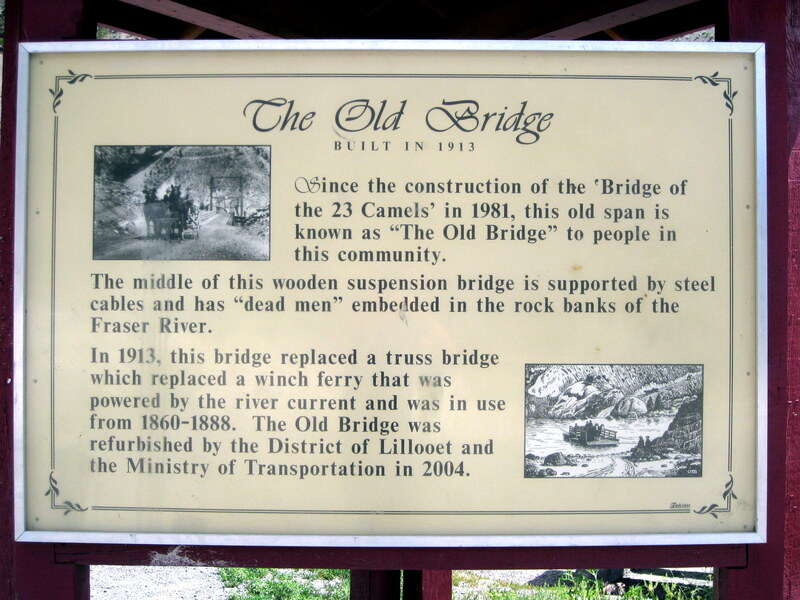 we stopped in lillooet for a stroll over the river on the old bridge and a nature break for max. the native fisheries have not started so we had the spot to ourselves and a lone osprey. the drying racks for salmon were the only evidence of the coming harvest. off to pavilion. a quick half hour drive and we settled in on the edge of the small lake at marble canyon provincial park. the lakes here are particularly colourful, vivid blues and greens nestled against the mountain side. we had the shore to ourselves and a choices of picnic tables…rick’s packed lunch was delicious, sandwiches on homemade bread, home-grown lettuce….and of course peanut butter cookies made the day before. max is becoming a water dog, he seems to get braver with each outing, getting into deeper water where he has to swim. homeward bound via cache creek south to lillooet with a brief diversion for a new bandana at the cowboy store (great hats and prices) just south of spencer’s bridge. stopping as we went to check campsites for outings later in the summer. the thompson was high, hiding the jagged rocks that make it froth and churn for the raft riders who flock to the area during the summer. we should have allowed time for a stop in yale to sample the strawberry tea held there annually, it sure seemed popular…oh well, next year! home in time for the tony awards. perfect day!